Where do I start? From the moment I first saw you 15 years ago in the rescue kennel, I knew you were the one. You rushed into my arms like you were greeting an old friend and was determined you were coming home with me! Passing all the little tests we had to see if you’d make a good ‘hearing dog’ for me. My dad helped me train you, so you were an important link to him after he passed away. You never left my side through all the toughest things I had to go through, you were the only one in my life who was there every single day and every night to snuggle up and kiss away the tears from loss of family, the high & constant pain levels & fatigue, the transition from walking to wheelchair and the battle to get back to semi independence. You learnt everything I needed you to with enthusiasm and without complaint. By the time I was needing a wheelchair full time you were alerting me to phone, doorbell, had already saved my life once when some oven gloves really did catch fire after I’d fallen asleep on the sofa. … and bravely ran off for help one time when my wheelchair tipped over in the park to get a ladies attention and bring her back to me. Not to mention the numerous times you picked up everything I dropped, helped me off with my clothes, emptied the washing machine and dryer for me and just made living independently possible! You were my original canine Angel. Even accepting your ‘little brother’ JJ and teaching him so you could retire. I know that was so hard for you after having me to yourself for 11 and a half years, but I’m so proud of you for doing that for me! You trained him well, he learned so much from you. JJ will miss you too, you’ve been his ‘big sis’ since he was 8 weeks old and I know you had got quite fond of him in the end! He was a big help to you when you started going blind and I know you found comfort in him being by your side too! You take a huge chunk of my heart with you over to Rainbow Bridge. You were my soul mate., my special girl, my rock, my independence, my life. 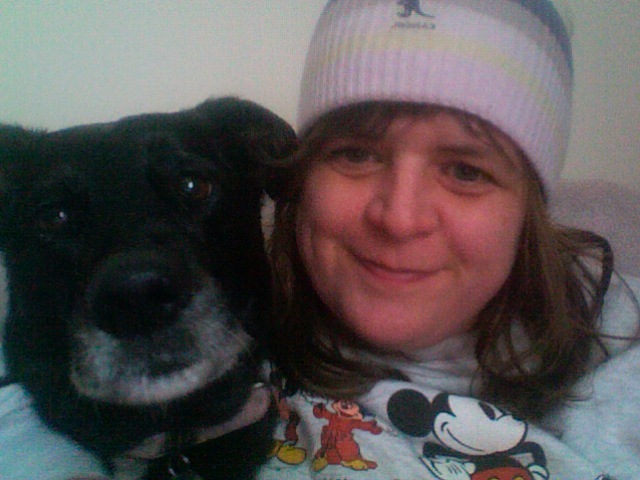 Who would have thought when I picked that little puppy out of rescue nearly 14 yrs ago (she was 4 months old when I got her) she would not only become my ears and help me round the house but also help me to train up another dog! I was fully mobile when I first got her in 2001 but had been deaf since age 16. My dad wanted me to have a dog living in a flat on my own. He was worried flashing house lights (to tell me doorbell, minicom was ringing) would make me an easy target for burglary and thought I’d be safer with a dog. So I went to local rescue with my then sister-in-law and that’s where I found Inca! 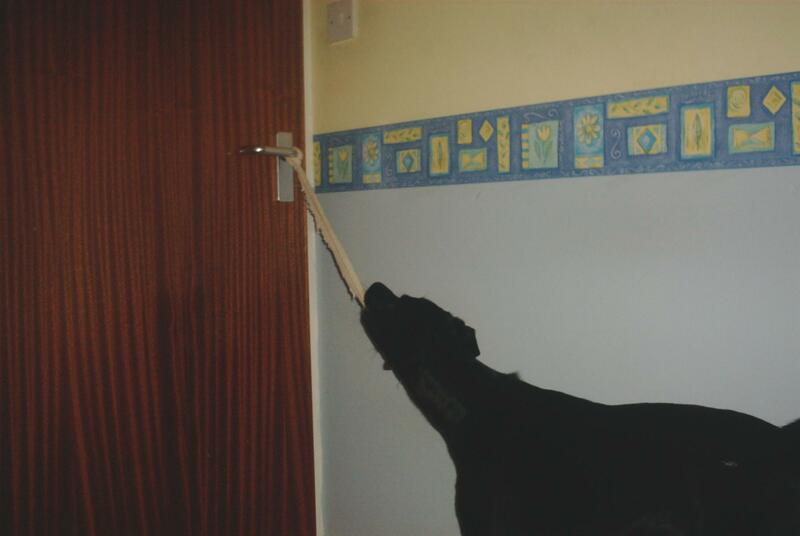 My dad helped me train her to smoke alarm, doorbell, someone knocking on door and minicom ringing. Sadly he passed away the following year and wasn’t here when I started to have problems with my back and legs. 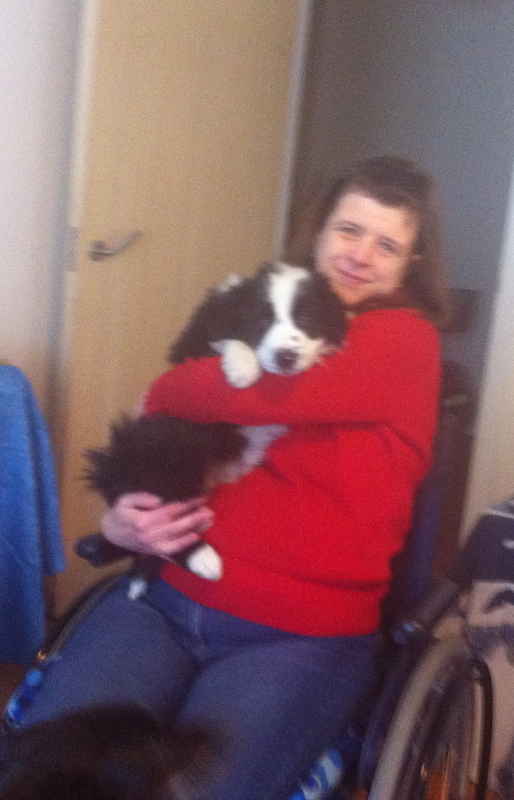 My mum had passed away years ago back in 1991 so if Inca and I were to survive together she would have to learn to help me as by that time it was becoming apparent I would end up in a wheelchair. It took just 18 months for me to go from being able to walk ‘normally’ to being issued with my first manual wheelchair by the NHS. Inca really stepped up to the plate after being a rather naughty puppy!!! ..and generally pick up whatever I dropped. She saved my life once after some oven gloves dropped onto the back ring of the electric cooker (that I’d accidently left on) and caught fire. I’d fallen asleep on the sofa watching telly, The smoke alarm in that flat was in the hall but the door was shut, also the batteries unbeknown to me the batteries were flat!..the alarm never went off but Inca woke me up and dropped into the ‘danger’ position (drop into a down and bark to signal danger) looking worriedly towards the kitchen. I sat up and looked in to see it filling with smoke!! She coped well with moving house as the flat wasn’t exactly easy with a wheelchair and a scooter parked in the narrow hall, and was thrilled to have her own garden and a new padding pool! 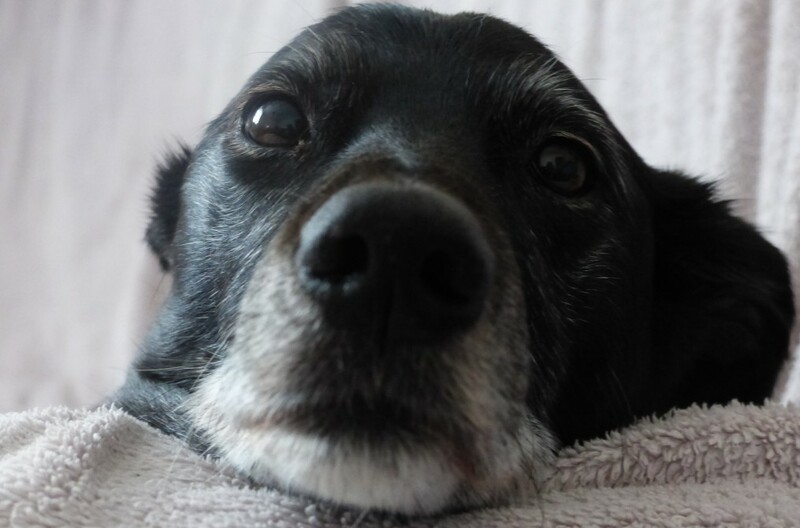 She gave me many years of independence but when she was reaching 11 years old she was starting to get arthritis and I had to decide what to do, she wasn’t going to be able to help me forever, we’d both need someone else! After a 7 month search little JJ came to our lives! 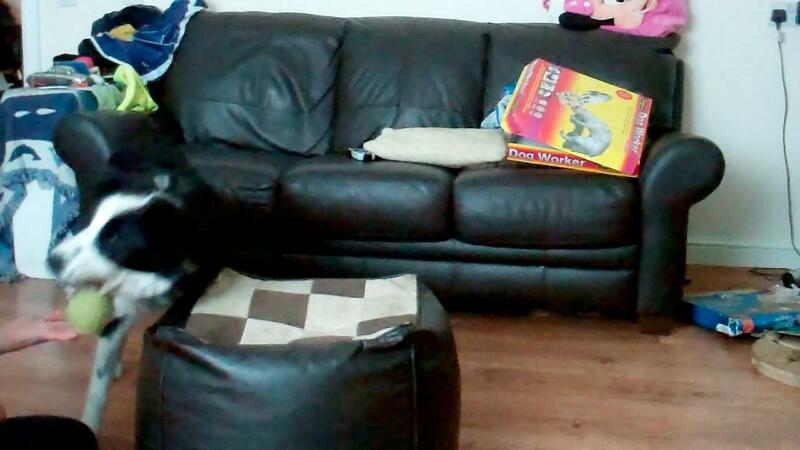 It’s fair to say she was less than keen to welcome a young boisterous puppy into our quiet household! 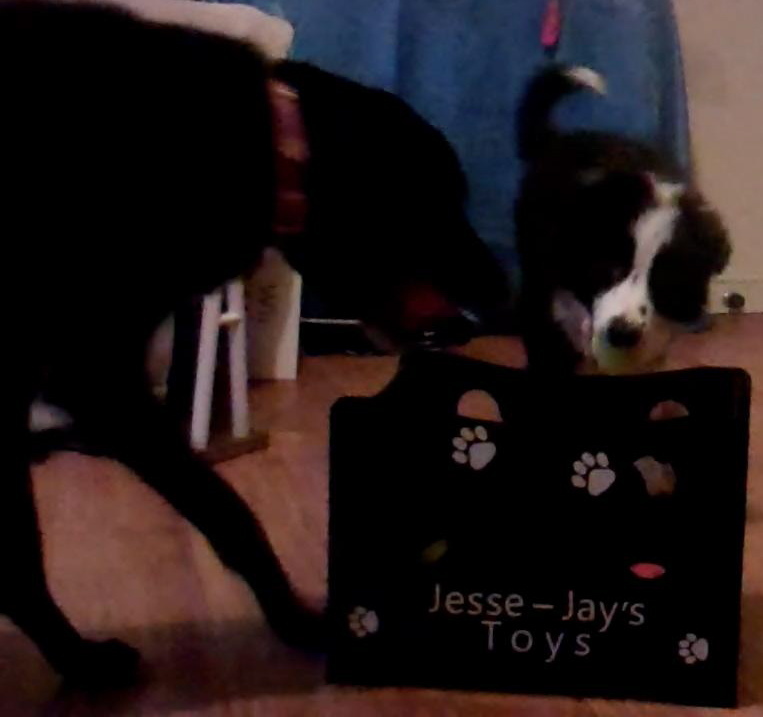 … but she coped and became his mentor showing him how to do jobs, it was much easier to teach JJ how to do something by getting him to watch Inca and then copy. 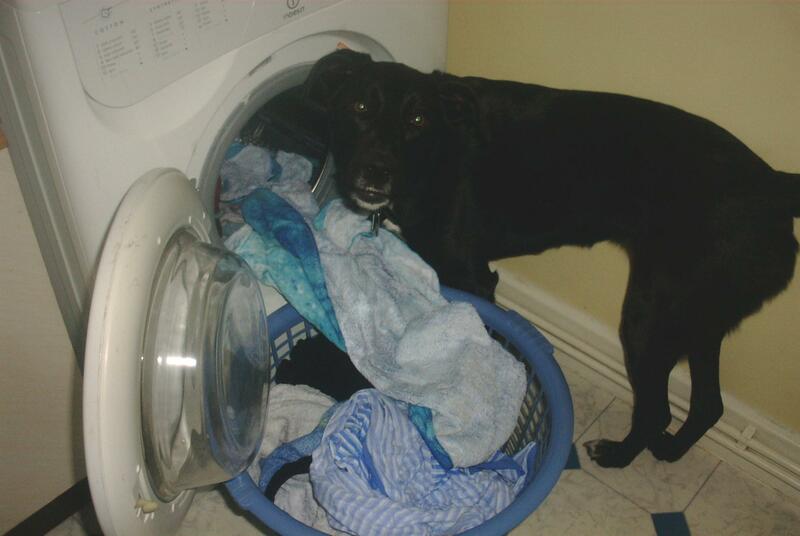 Almost everything JJ can now do, Inca taught him – he did come up a few things himself though as he’s also a very bright dog! 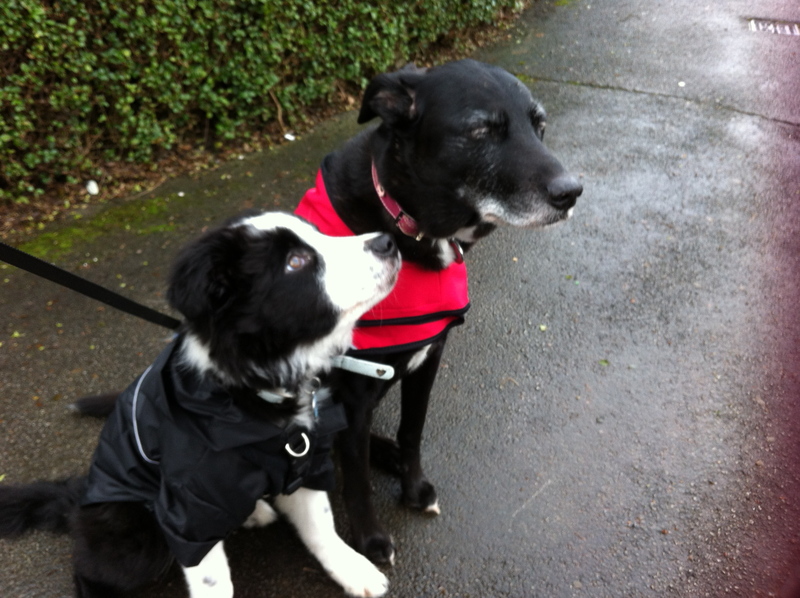 I was particuarly proud of how she coped with and taught JJ though as being an only dog for 11 and half years before he came I knew it wasn’t easy for her and she’s had the pain to cope from arthritis and is going blind. I think now though he’s a comfort to her and without him I wouldn’t have managed to support her in her old age. Happy Birthday my special girl!! I haven’t posted for a while and alot has happened. 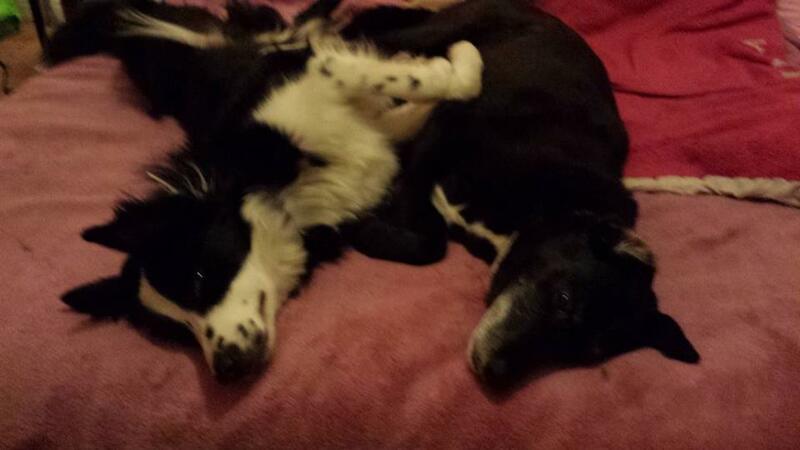 JJ has turned 2 years old and my special girl Inca has not been well and suffering the effects of old age. She has cataracts and her back end is wasting. I am hoping to have one last xmas with her as we are only a few weeks off now. However this is not the reason for my post. There was been several posts in the media about Liz Jones a reporter for the Daily Mail who is deaf and claims to have FOUR Hearing Dogs! Whilst there’s nothing wrong with training your own pets to help you around the house, what is wrong is that she takes them in public places where pets are usually not allowed, claims they are ‘hearing dogs’ and admits that they don’t always behave in public! She also deliberately misleads readers by posting a stock photo of a spaniel in an old Hearing Dog jacket whilst talking about her dogs. I hadn’t heard of her before reading this article so thought it was was one of her dogs and wondered HOW she managed to get hold of an Official jacket which are only given with a dog trained by Hearing Dogs for Deaf People? I’d like to state that I have NEVER once taken either of my dogs into any area where pet dogs are not usually allowed and claimed they are my assistance dogs. 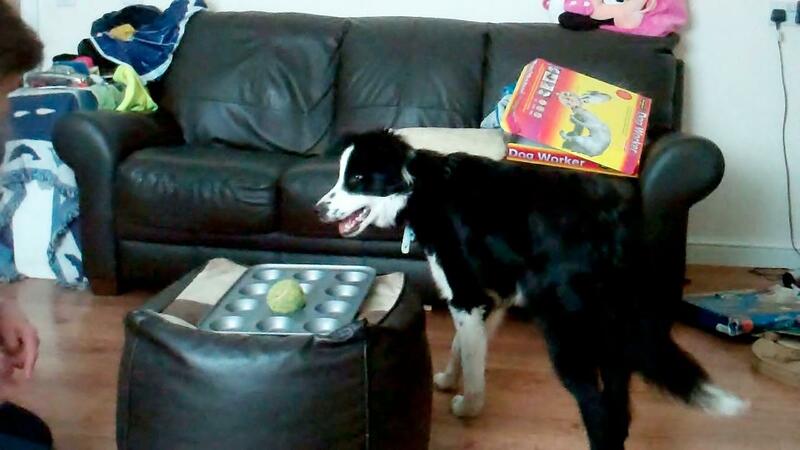 Not even when I lived nearer to town and could walk to the shopping centre with Inca who was then a young dog. At the time of getting Inca I had been waiting a few years for an Hearing Dog, I lived on my own in a flat and my dad was worried as it wasn’t a good area. He felt I could do with a dog for protection and he felt flashing house lights to let me know someone was at door or phone ringing was a bad idea. So I went to a local rescue and got Inca. My dad helped me train her where two people were needed (for him to send her back to me when she naturally ran to door or smoke alarm). 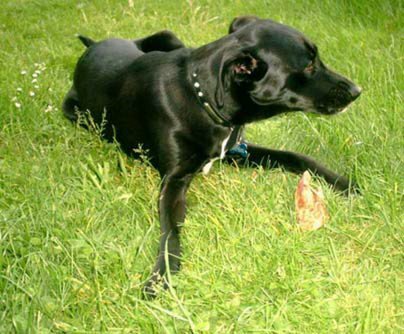 This was 13 yrs ago, there was little literature about how to train a hearing dog. you occasionally saw them on TV but I didn’t have the internet then. We learned as we went along. She did what I needed her to do, if I went shopping I went by myself. 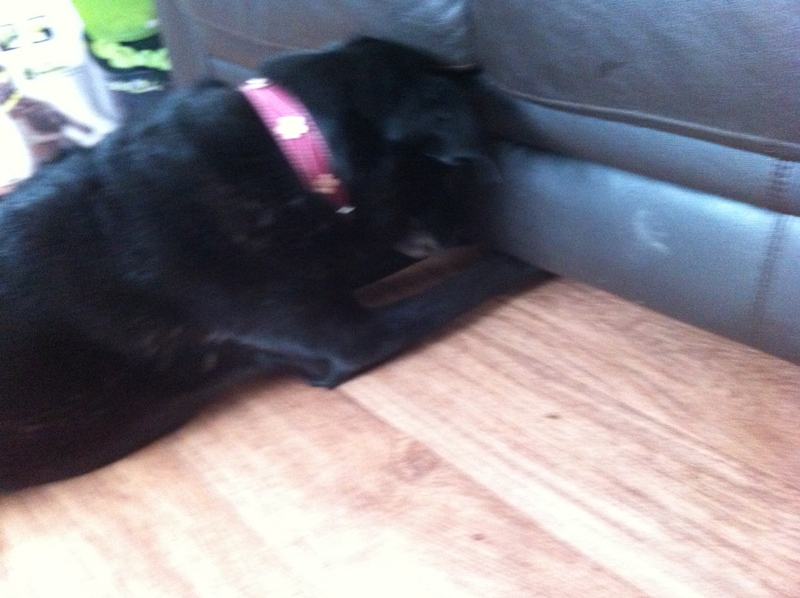 Fast forward 10 years..Inca is now 11 and half and starting with arthritis. I needed to make a decision. I had by also been a wheelchair user for nearly 7 years and had also managed to teach her to pick things up for me, empty washing and dryer and help me pull my clothes off. 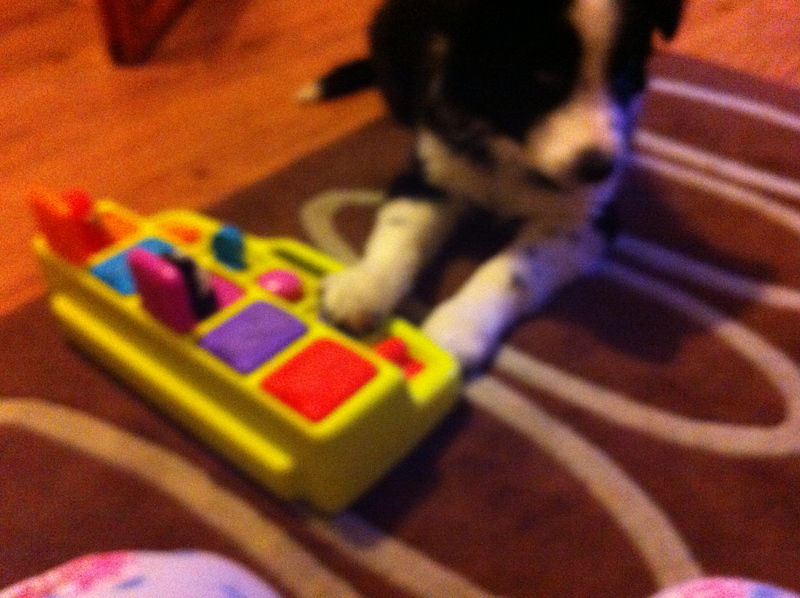 However I’d now need a dog to learn everything at once! I looked into and sent applications for a Dual Skilled Assistance Dog trained jointly by Canine Partners and Hearing Dogs for the Deaf. However the more I read about the process, the more I was unsure it was right for me. If I got lucky and didn’t have to wait long I’d have to go to training centre and come back with a dog..how would Inca cope with that? 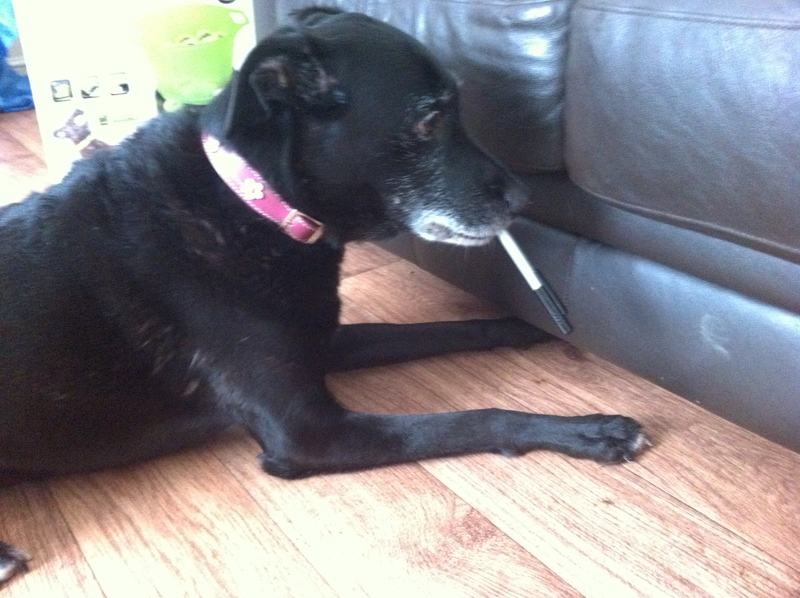 Not only is it a new dog, its taking over all her jobs. If it took a long time, Inca may have passed away and I’d have a period with no help at all. The rules seemed many, but the most important fact is the dogs are extremely well behaved and virtually bomb proof in public, so they undergo years of public training from being very young puppies they are allowed in places where most pet dogs are not so they can gain that experience. If you choose to get your pet dog qualified yourself by a charity such as Dog Aid they have to be over 2 years old to take the Public Training exam so already you are working to a disadvantage regarding working in public. 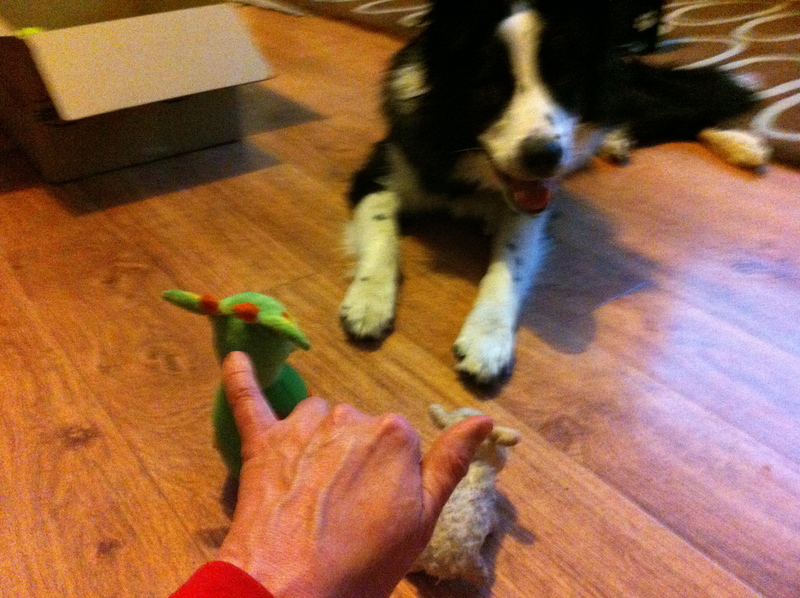 I am not a professional dog trainer but have managed to train a Border Collie (bred to work sheep) to help me around the house. He does a great job, we have a strong bond, he loves to help and having his little ‘job’ to do, he even does things himself that I haven’t specifically taught him. He’s nudged my foot several times whilst on farm track when a car was behind us waiting to pass I never taught him that, only to ‘tell’ me when he heard a sound I needed to know about ie minicom, doorbell, smoke alarm. He’s a smart dog..Border Collies are often voted the Top 10 most Intelligent dogs so it came as no surprise that he figured out himself that a car behind us was something I needed to know about! 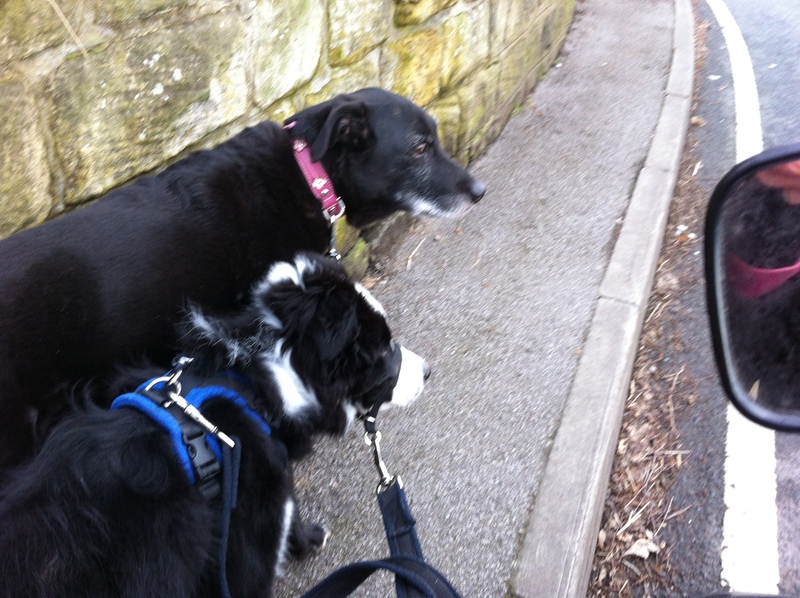 He’s also taken it upon himself to walk next to Inca when she goes for a wee at night. She’s going blind so her night vision isn’t good, rather than him just going off to do his own thing he walks round the path with her, waits until she goes to the loo then walks her back to the door! 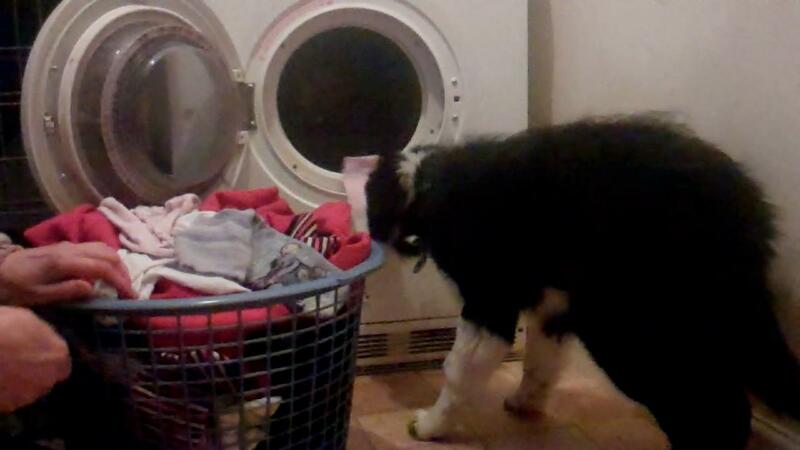 .. then he goes and has a wee himself and sniff about before coming in to bed whilst I help Inca to bed. I haven’t specifically trained this either! Despite his intelligence, he is strongly driven by his instinct to herd when we are out walking even though we’re in a village where traffic although busy at peak times gets nowhere near as bad as town. I have medical problems that make travelling difficult and exhausting and combined with distance from nearest town and cost via wheelchair taxi rarely get into town. I also need help getting shopping anyway and find busy areas disorientating with the bright shop lights and people bustling past especially as I’m sat in chair so my head is at most people’s waist height. To me it seemed a waste if a dog highly trained in social skills and to cope with working in public only got to do that a couple of times a year, surely that dog would be better off given to someone who could work but needed a dog, who didn’t have time to take off to train a puppy from 8 weeks old and most importantly needed a dog that could cope with a busy public transport and a workplace daily. 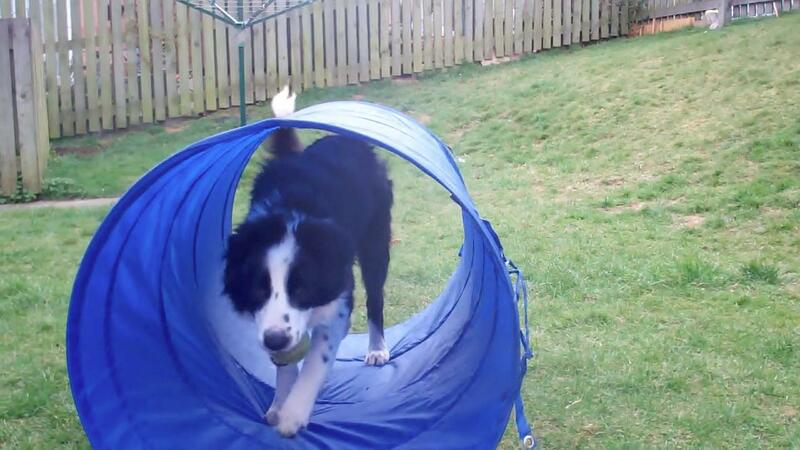 My home is ideal for a dog that needs a quieter life who could thrive with a bit extra personal attention, playtime, a few little jobs to do without the pressure. 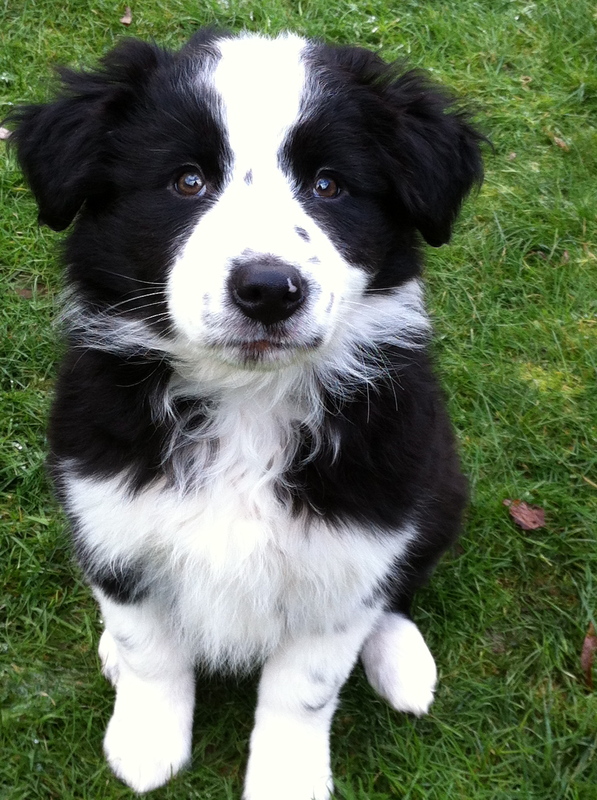 One of the breeds I’d always wanted to own in my lifetime was a Border Collie. A Traditional black & white one, it was my probably my last chance to manage a puppy from a very young age and I felt a puppy would be a gentler transition for Inca, she’d still be working while he was very young and their roles would change very gradually as he grew up and she grew old. It was the right decision for me. However some people don’t have the time or skills to train a dog, they want or need someone else to do that part for them. They need a dog that is reliable in public places and this is the major difference between an official dog trained by the charities and someone’s pet. Yes my dog does the work of a Dual Skilled Dog in MY home, he also acts as Inca’s guide dog! He’s very versatile, but he’s not experienced working in public because he’s never had that opportunity. I know he’d find it too overstimulating at his current age, whether he’d calm down further by the time Dog Aid were taking on new people I don’t know. I still think if JJ had a choice and I was able to travel/employ an helper to drive us somewhere he’d much prefer to go to the nearest sheepdog centre and have a go at herding, than go learn to walk through a busy shopping centre full of people, unexpected noises and bright lights, I don’t think he’d understand the connection (that it was part of the same ‘job’) between him enjoying emptying the washing for me at home and having to walk through a busy noisy place. However, Qualified assistance dogs are trained to cope with that from a very young age and this is the big difference between a proper ‘Assistance Dog’ and Liz Jones’ pet collies that she claims are her ‘hearing dogs’! I would question the fact she trained her dogs ‘to create a commotion if my fire alarm goes off’. If the dogs are barking cos she can’t hear the smoke alarm as she’s deaf then how can she hear them barking??? What if its at night and she’s in bed without hearing aids? How does the dogs barking and causing a commotion help a deaf person know whether there’s a smoke alarm going off or a burglar breaking in if they’re fast asleep and can’t hear the ‘commotion’??? Both my dogs automatically barked and ran about when young when the fire alarm first went off, JJ even howls he hates the noise! .. I didn’t train him to howl when the smoke alarm went off! I trained them to stop and think.. ‘mum needs to know about this!’ … they come and find me (its no use them just barking/howling in the kitchen if I’m in bed asleep and don’t have my hearing aids in) JJ understands I need to see him bark so he comes and actually get my attention by touching me that is a trained behaviour! 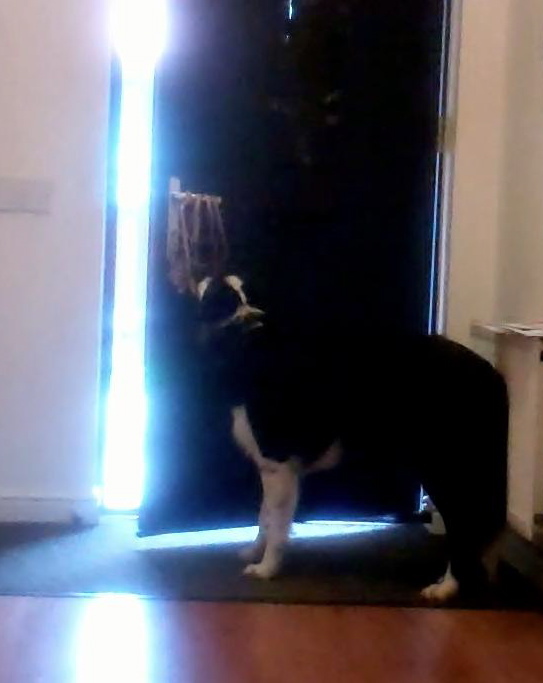 Although he still doesn’t like the pitch of the alarm and still barks he does do the actual ‘tell’ and he does the ‘down’ so I know its not just someone at the door late at night/trying to break in etc.. he gives a distinct sign its the smoke alarm. 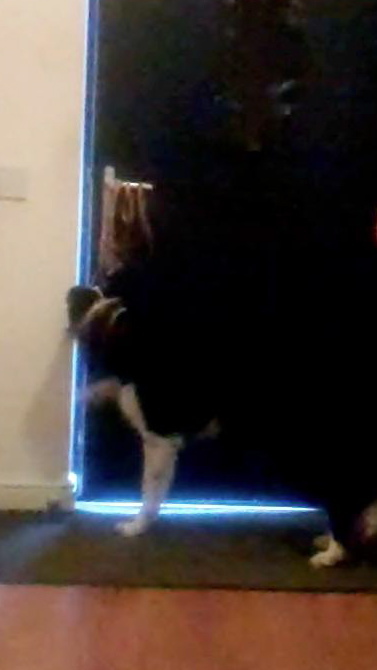 Dogs will naturally bark and cause a commotion if someone tries to break in too, how is that training?… a dog coming to physically prod you to tell you is not something they would do naturally as most hearing owners would just just run into the room they heard the barking from to see why they were barking! ..Even then a smart pet may jump up on a bed even if hearing owners don’t respond to him barking, many pets have saved their family from fire at night or a baby/child having a seizure at night etc that doesn’t make them assistance dogs! The difference is a Qualified Assistance dog is specifically trained from a young age to work in public. Maybe the charities need to get a slot on morning TV or something showing how the dogs are started from a very young age and the what the ID looks like that people carry so shop owners and other public service providers can recognise an official dog when they see one! It’s hard to believe that its nearly a year since a little bundle of fluff landed on my doorstep! (He came in Nov at 8 weeks old). He’s 1 years old today!! .. now 1 years old! 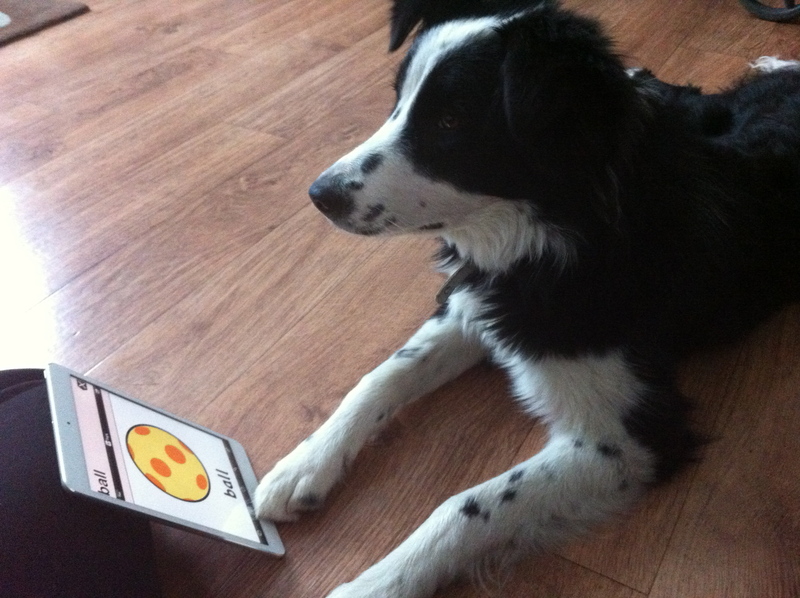 In his first year he has learnt from the puppy basics such as toileting and the regular commands such as sit, down, stay to concept words such as which, where and is able to follow sentences/requests with several commands strung together. An example of one of more complex jobs would be coming in from walks, particuarly where we have taken Inca’s trailer with us. 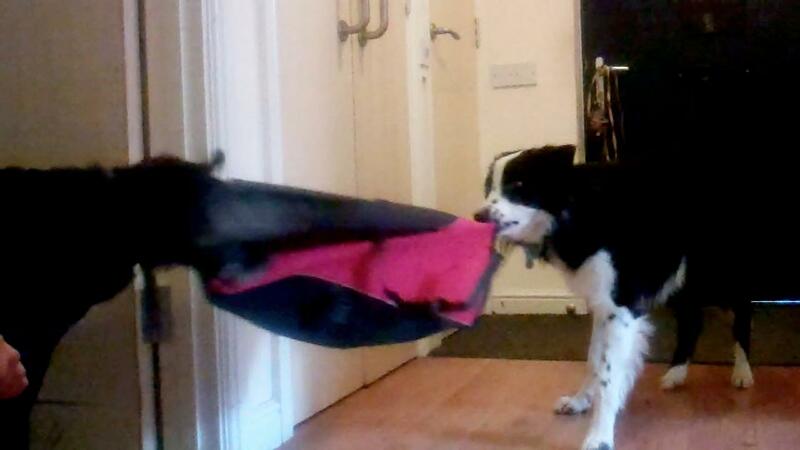 First he’s pushing open the door, closing it behind us, bringing my chair to me, going into the spare room to get ready to help me pull the trailer back in, helping me remove my coat, he’s even helped Inca take hers off!! 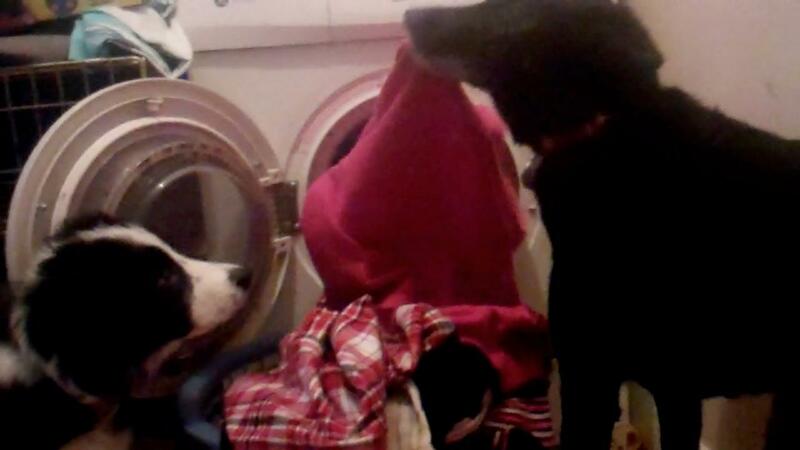 he even helps Inca pull her coat off!! He’s also been helping me undress everynight for the last month or so and seems to have grasped the concept of coming to tell me when he hears something. I was going to keep it just minicom ringing and smoke alarm, but he has developed a very useful one himself without any specific training! Several times whilst on the scooter he has nudged my foot usually its when we’re on a farm track and there was only us there when I asked him “What?” he looks behind us and EVERY time so far there has been a car behind us waiting to pass! 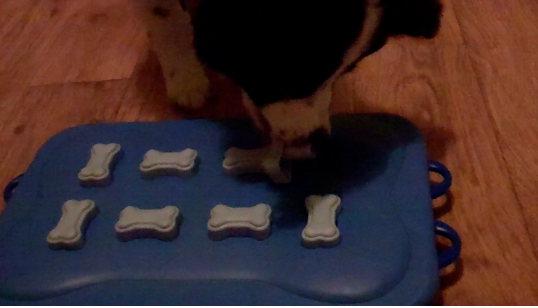 I never specifically taught him this one but he gets very high value treats for this one as its a very useful one! It’s made a huge difference having him from so young and him growing up in this situation as he has just learned everything as a daily routine. It is ‘normal’ for him to know both sign and my speech. I want him to learn both.. after all if I fell and broke my arm I couldn’t sign to him and on days when my speech is bad getting words out is difficult its really handy if he knows both. A whistle isn’t always helpful as you need co-ordination in your throat muscles to whistle and strength to get out any volume! 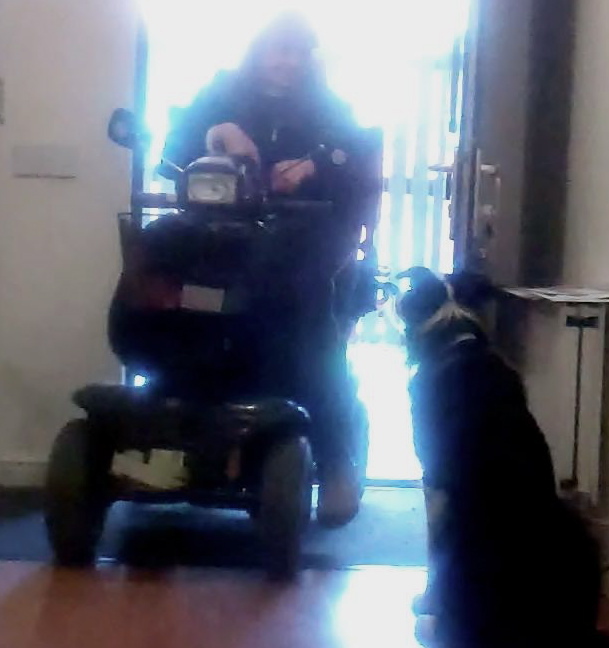 .. sometimes I can get a sound out of a whistle but he also knows to recall to scooter or powerchair horn. Dogs do not naturally use language to communicate within their own species, they rely on body language. So teaching signs are helpful for some dogs and less confusing than words, if they have difficulty separating when you are speaking in general or speaking to them to give them a command. But to teach a dog to do more advanced stuff they need a level of greater understanding of our language than the basic commands of sit, stay, heel, down etc. The first command needed to be ‘look’ (at me), I can’t always get words out well and he’d need to rely on working out what I was trying to sign… before he could work out what I was trying to sign/say he needed to understand what the words meant, so began the quest to teach him to associate a certain sound/sign with an action. His most complex work was going to be following directions to get something for me.. either something I dropped that had rolled under a table or find my mobile in an emergency when I’d fallen over so he needed to learn vocabulary such as.. on, in, under, behind, go round, look, there (pointing), which, where is it?.. names of rooms.. so I had to have a think and create some games specifically to teach all the language he was going to need. 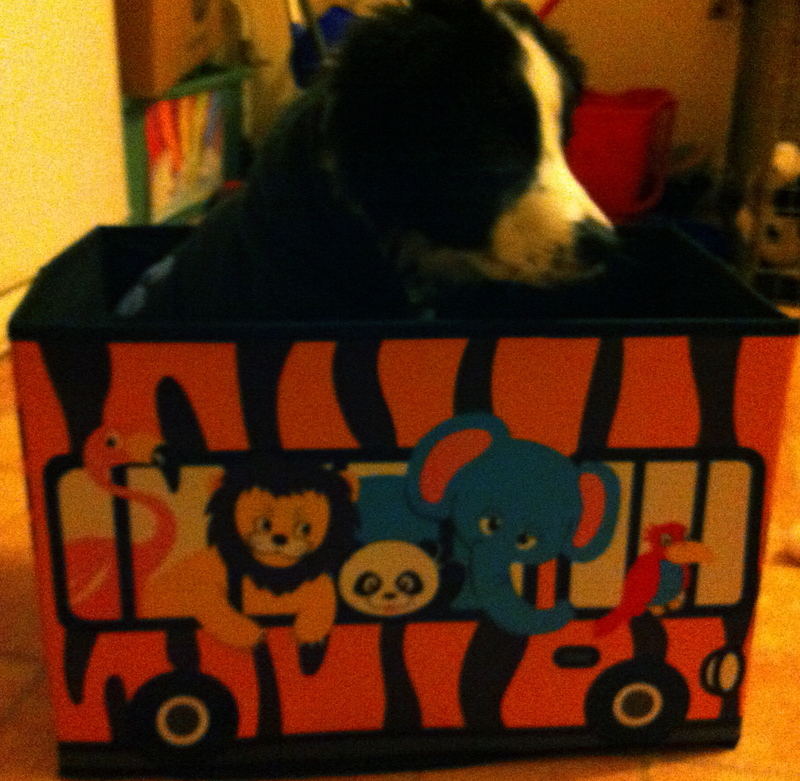 JJ is IN the toybox! 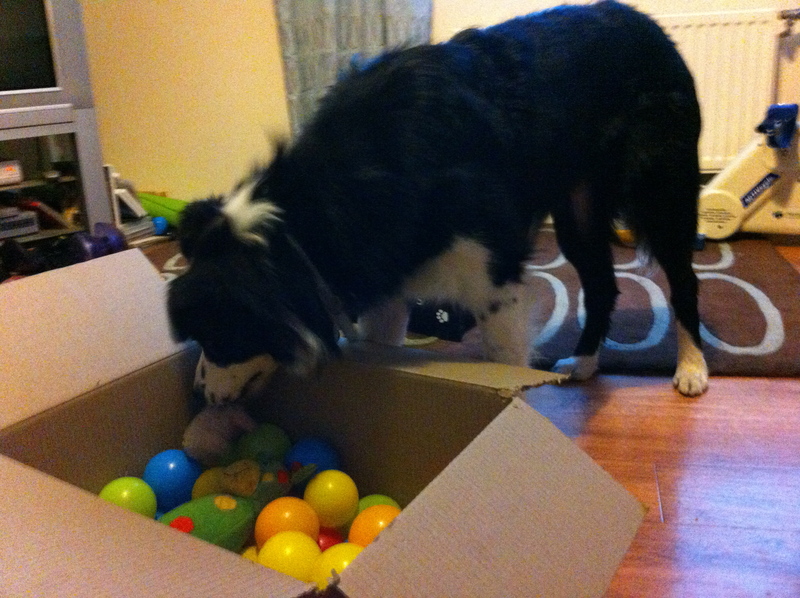 .. after choosing his toy.. (sheep) he left the room.. and I hid it in box of balls.. I make him sit before he comes in and first sign ‘box’.. to see if he would go straight to the box or randomly search the whole room. The next time I may sign ‘box’ then ‘in’, then ‘sheep.. box.. in’.. (the signs follow BSL structure not English). Other useful language is ‘go round’.. that can also be used outdoors where I am often going along a pavement on road to find a car has parked half way up and scooter can not get past, if its a busy road I prefer the dogs to stay on the pavement. Inca will ‘go round’ between the car and wall.. JJ has been riding on scooter to pass them when he was small.. when he is more confident on busy roads and will stop and wait at the other side of the vehicle, he will do the same as Inca. .. several of these skills will come together later for example the game where he was learning to post the letters in the plastic postbox combined with him been able to ‘go round’ between car and a wall when someone has parked too close to postbox and I can’t get scooter right up to it.. I can send him forward.. letter in mouth to post it! We also play ‘find the phone’.. I start off in the room where he can see it ask him ‘where’ and point ‘look’.. even though he’s just seen me put it there he’s also learning to follow a pointed finger for when he didn’t see me drop/hide something… then we move outside of the room and I point back in ‘in the room’, ‘in the kitchen’, in the bedroom etc… if I fell in the bathroom in future and I knew my phone was ‘IN the room ON the table’ I can direct him where to look. 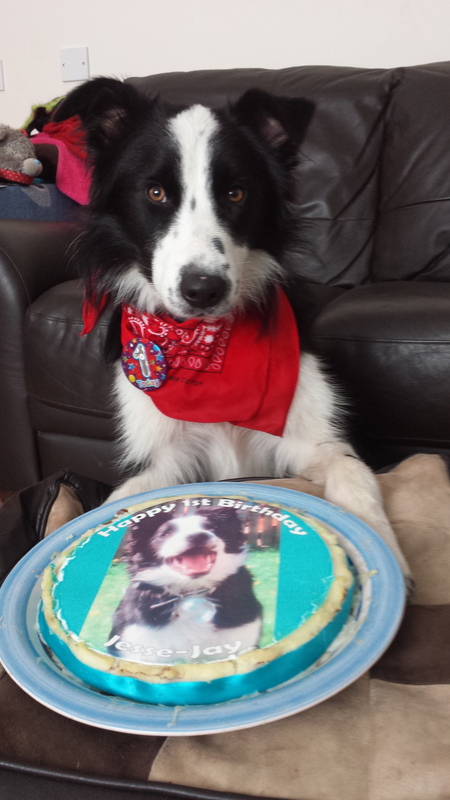 Well my little boy is now 6 months old!.. not so little.. he’s only a few inches off Inca height wise now already! I try to give him an healthy balance of time to just ‘be a puppy’ with time I need him to learn.. or to start learning, the foundations ofthe skills he is going to need when he takes over from Inca. As mentioned in the last post I teach them through play. Sometimes he just does things that turn into a training session, others I plan what I am going to teach him, how I am going to incorporate it into a game he will enjoy.. that will carry on to become a useful skill as he gets older. Recently when we’d had some nice weather I had hung some stuff out. 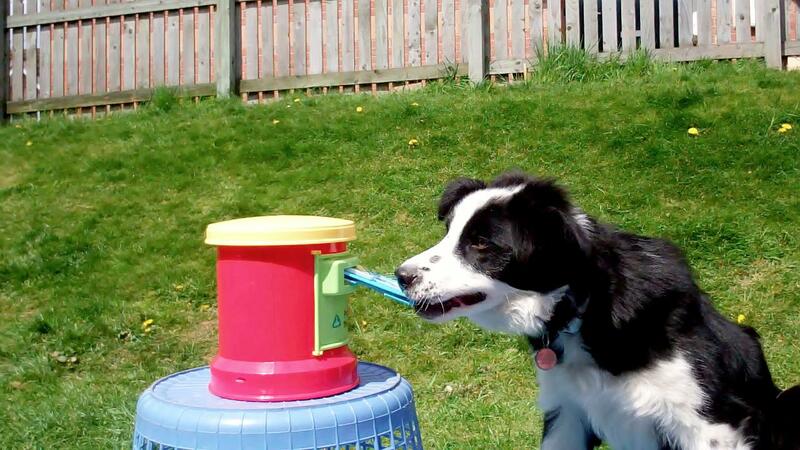 JJ watching Inca carry the peg basket out into the garden then also wanted to join in! 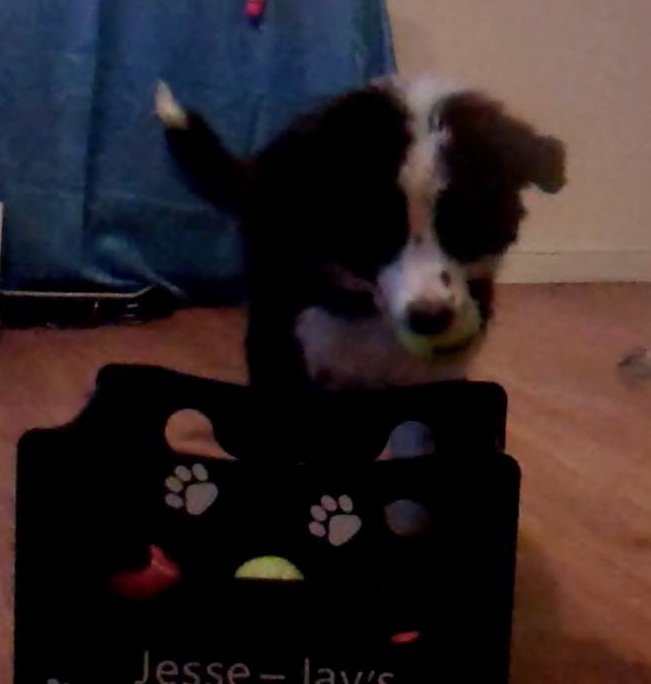 I got him his own little basket to put his toys in. he’s not quite got the hang of it yet and drops them but at this early stage that doesn’t matter. 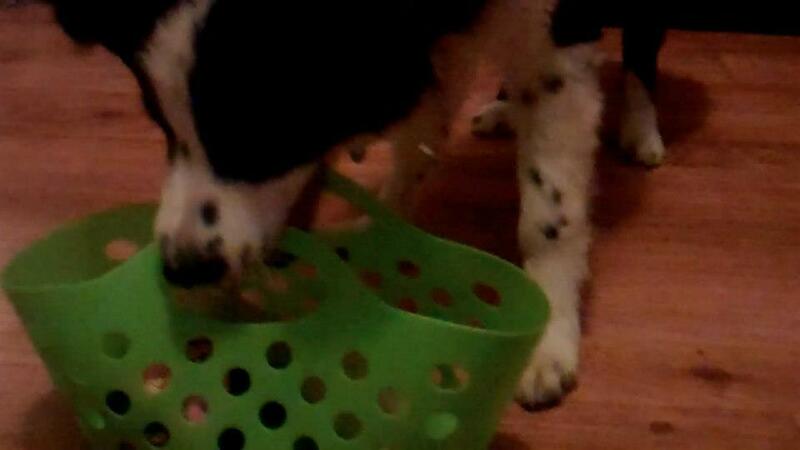 He’s learning the skills he’ll need later to understand how to carry the peg basket out for me. pick up any pegs I drop and put them back in or pass them to me. He’s come into bathroom barked and run back to kitchen when kettle had clicked off but I think that’s cos I always boil the kettle just before doing their dinner as Inca needs her kibble soaking so he’s made the association between the kettle and their dinner following. I didn’t teach him to do that. 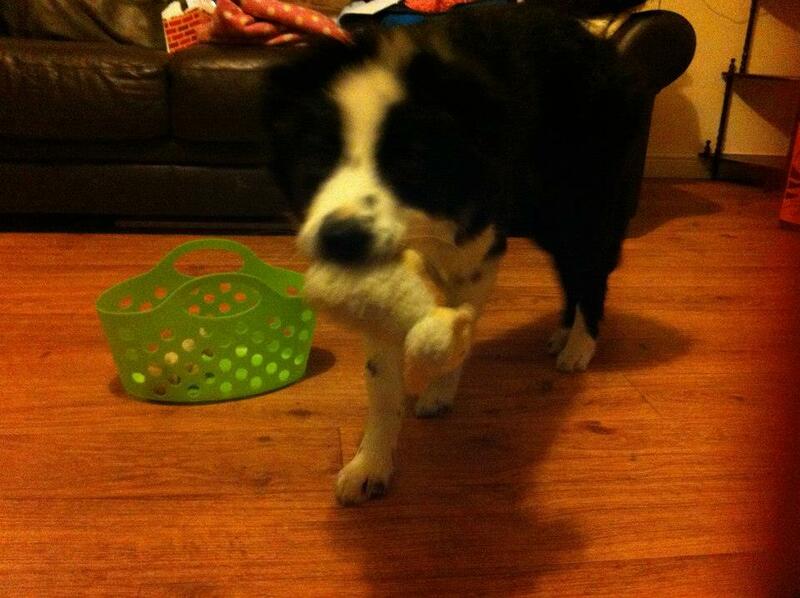 Puppies will be puppies and sometimes run off with things.. I get Inca to go pick something up so he can see and/or hear her getting a treat or big fuss for it. At first he’d run back in without the item he’d run off with. 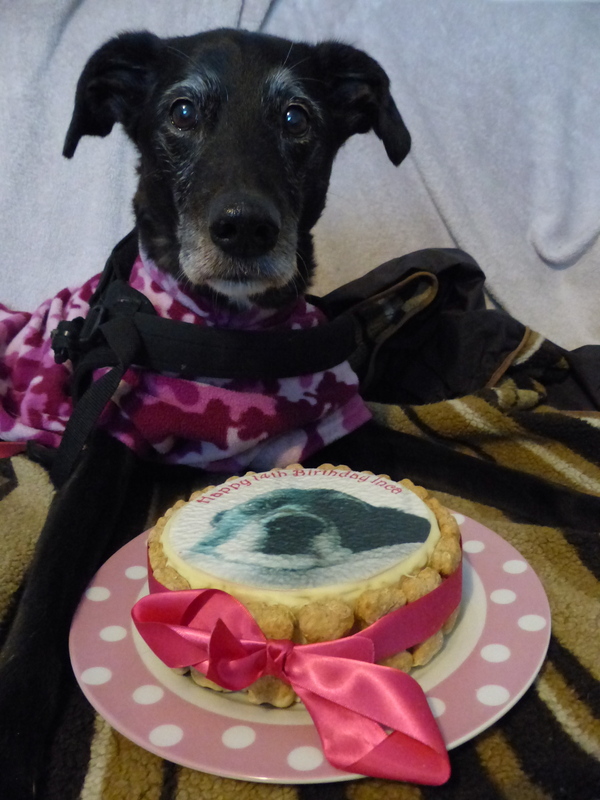 I’d get Inca to go fetch it and treat her again.. by that time he’s desperate for one of these treats!.. so I throw or place item on floor closer and wait for him to go for it, as he did I click and say/sign ‘pick it up’ and then ‘give’ just as he’s getting close enough to give me it in exchange for a treat. It didn’t take him long to realise he’d get more out of bringing something to me than running off with it and now regularly picks up things I’ve dropped often without me needing to ask. He doesn’t only associate it with the house or training sessions either, recently he did it unprompted in the park as I dropped my glove whilst trying to unclip his lead to let him off to play. I’d spent ages putting together a little slideshow..then found WordPress won’t accept anything other than it’s own which is disappointing after I uploaded 20 pics. If you click on link below, it should take you to it as it seems unable to embed the link in the page anymore either! I think I maybe trying a better free blog so if anyone knows of one better for free where the links and slideshows on whatever program you have on computer will work, I’ll be interested to know. 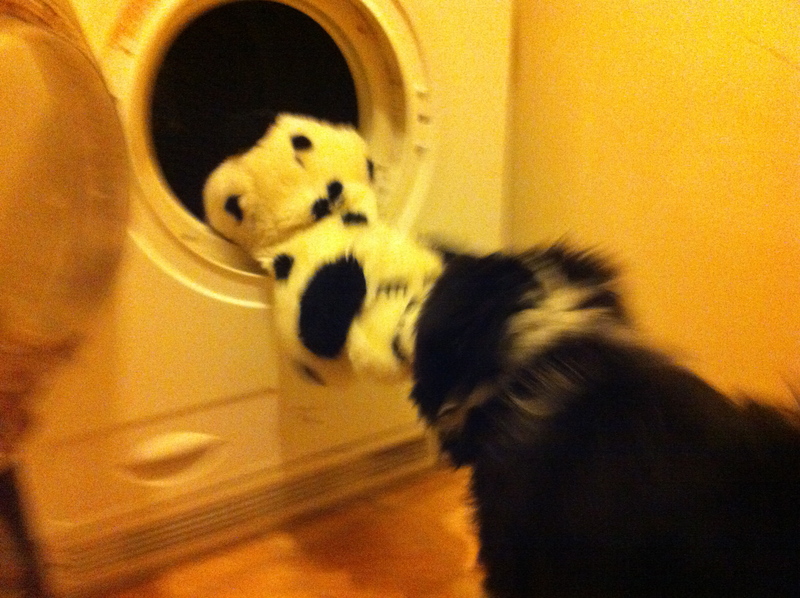 I’ve been asked by several people how I trained Inca to do the jobs she does for me. As I wasn’t on internet much then I never did a blog, no camera phone or anything then to take endless photo’s of every stage! She was older and had basic obedience before I got first symptoms of Ataxia and nearly 4yrs old by the time I was teaching to do tasks like helping with dressing by which time she had all the vocabulary she needed for me to teach the ‘job’. With JJ it has been very different. He arrived at just over 8 weeks, a little fluffy bundle eager to cuddle, play and eat but with no comprehension of language or ability to follow instructions!.. 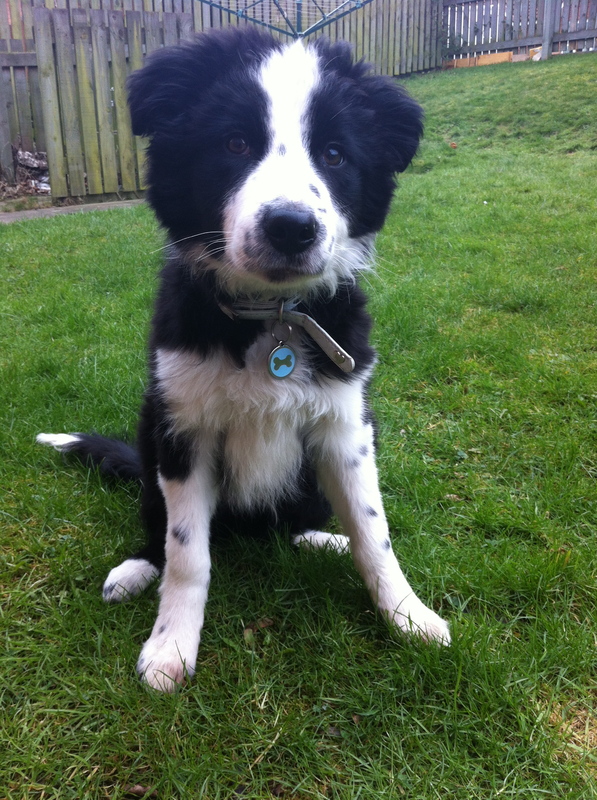 so how do I shape my fluffy little bundle into my full time helper by the time he reaches maturity? The easiest way to start is wait until he does a behaviour naturally… ie sit, then say or sign sit you have to pretty quick for him to get the connection at first. Clicker training is very useful for this, He sits, you click immediately and then treat, soon he will associate the click with the action. a ‘sit’ and ‘look’ beautifully demonstrated by JJ! 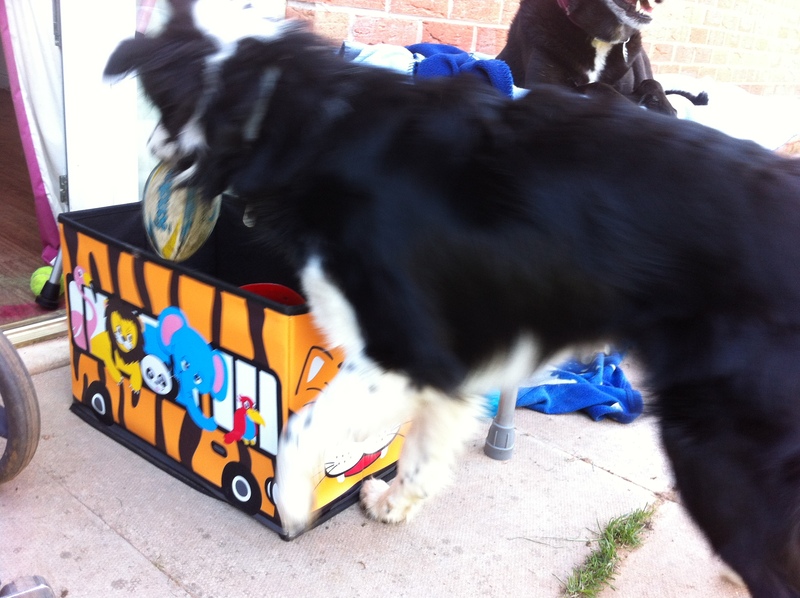 Interactive games are great for reinforcing the actions you want to teach as they work out how to get their food out. For some skills I needed to work out a way to teach it specifically.. if it’s more complex you need to break the jobs down into stages.. work out what command needs teaching for each stage, teach the commands first seperately then put the task back together again. He will then be able to do more complex tasks where several commands need to be strung together to complete it. Here’s an example.. 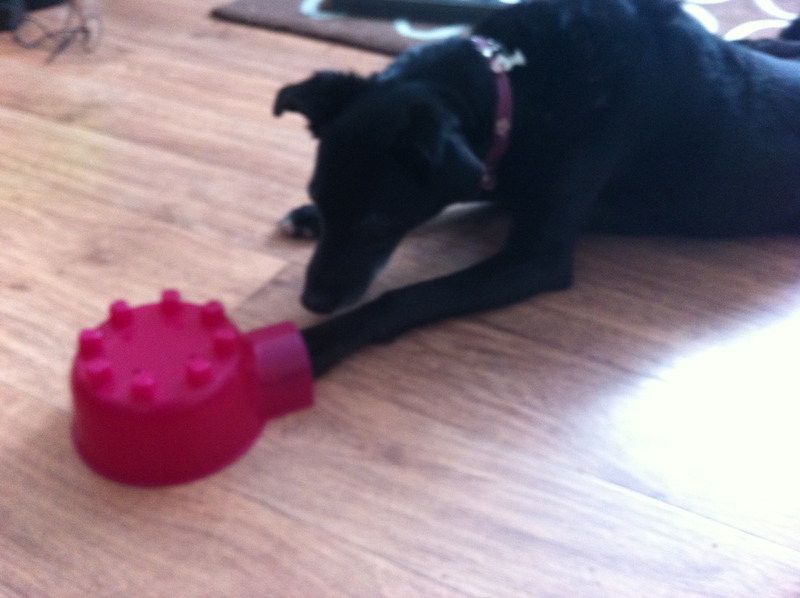 I taught Inca to slide something out from under or behind an object by using this toy. Another toy I found good for teaching a variety of skills is actually an infants toy called ‘pop up pals’, it has a variety of different switches to activate to get the ‘animal’ to pop up. I then treat. 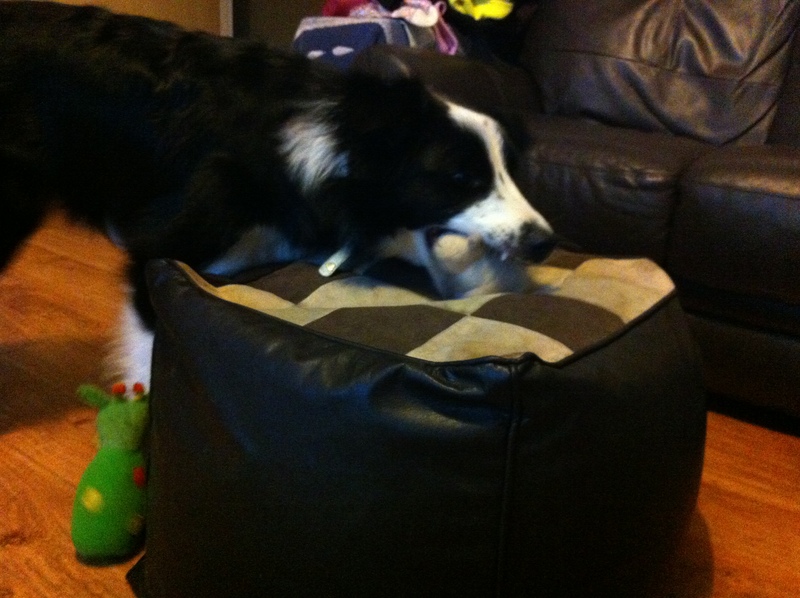 This was Inca’s and bought before they started making dog toys that now do the same. 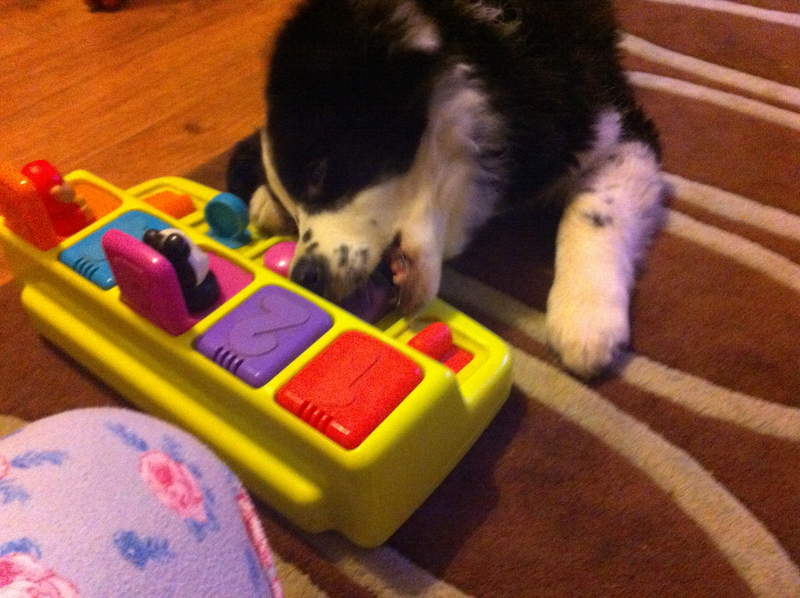 JJ has to work out which can be pressed easily with paw..
.. or maybe it be easier with his mouth? These problem solving skills can then be applied to real ‘jobs’ I need him to do for me as he gets older. 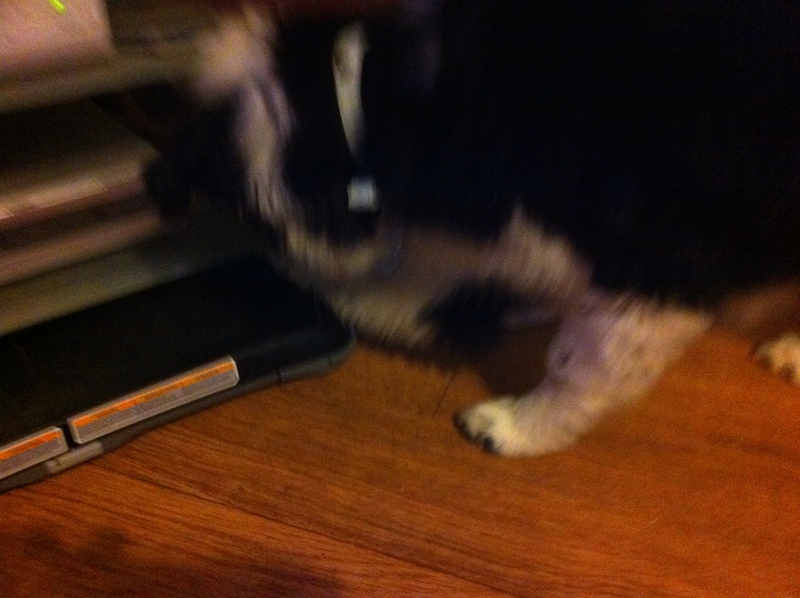 The other day he worked out how to get a pen that had dropped under front of TV cabinet. The most useful skills that can apply to several easy ‘jobs’ are ‘pick it up’, ‘bring it here’, ‘pull’ and ‘put it in’ . 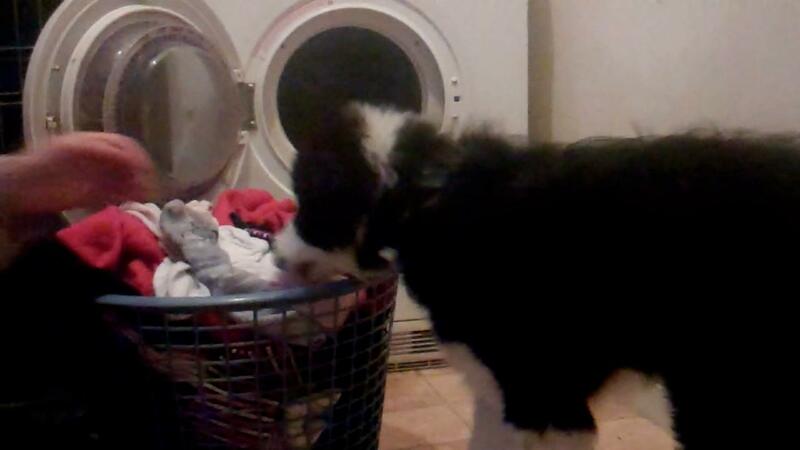 in a later session Inca shows him how to apply ‘pull’ to get washing out for me.. This is just the beginning, he is only 4 months old on 23rd January this month so he still has a lot to learn before all this becomes automatic and he can take over fully from Inca so she can ‘retire’. Of course he’s also been learning toilet training, basic commands and road safety, coping with teething and has yet to go through his ‘teens’. So he has a busy 18 months ahead of him!! 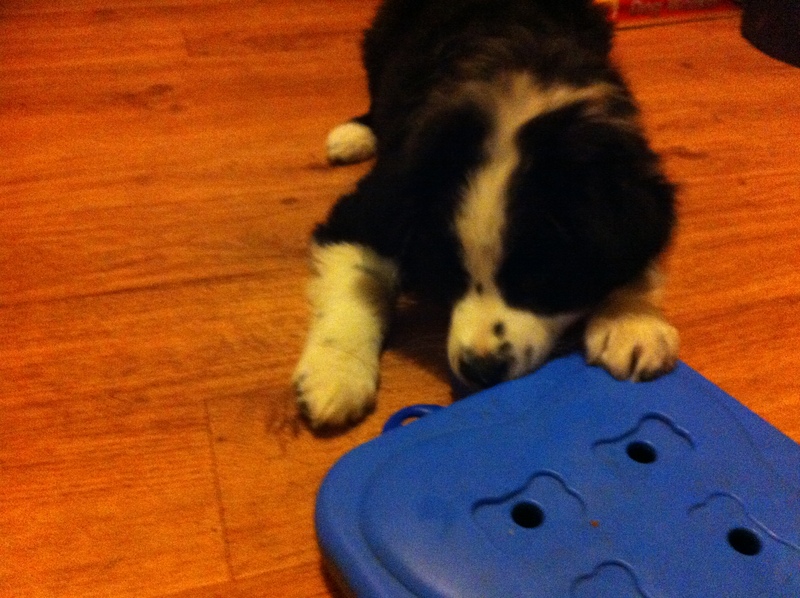 I have every faith in him though, he is a bright little boy and that natural collie intelligence will get him far. The first time I let him off-lead in an enclosed tennis court, part of it is a on a slight slope at the far back of it, so when he brought his ball to me it would roll under my scooter. The third time without me giving him any prompts at all he put his paw on top his ball as I approached to stop the ball rolling under my scooter!!! 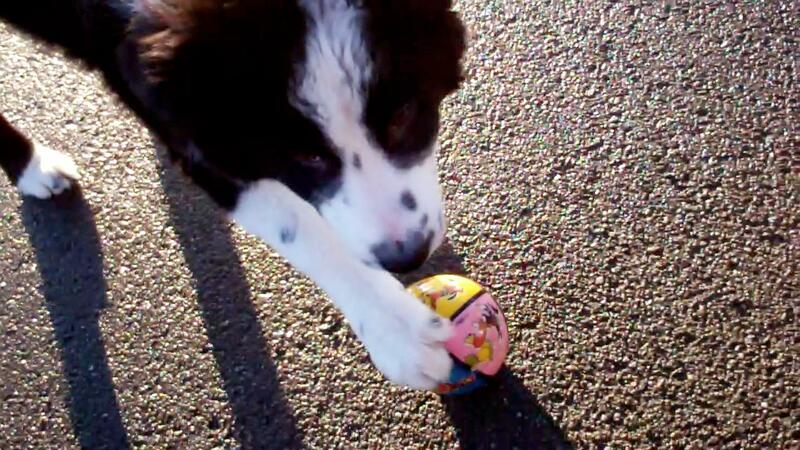 paw on ball to stop it rolling under scooter as I drive up to him!